couples, potential couples, pregnant women, young ladies who want their womb prepared for conception in marriage, and even for all men who love their wife". It is a timely revelation that will birth the manisfestation of another era of the baby boom on earth. The Blessing of Sarah is a plan of God for this time and season for those who desire to give birth in their lifetime not withstanding the prevailing limitations. 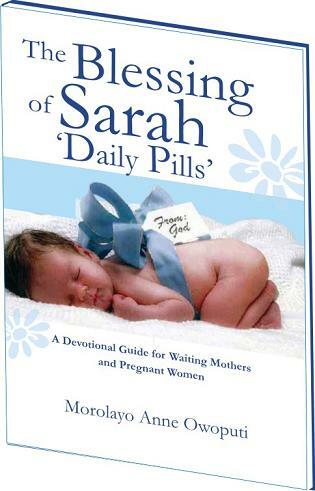 The Blessing of Sarah Daily Pills is a Companion Devotional Guide for Waiting Mothers and Pregnant women. It has been designed to help them pray Word-inspired and God-centred prayers during devotion. These thirty-one pills if used daily, periodically and over time will impact you with power for the impossible and invoke God's blessing on your life for conception, full-time gestation and a safe descending delivery. You can also read up the related chapters on these issues addressed from the book The Blessing of Sarah. A must-read for all expecting couples. So go get your copies fast for yourself, family, friends and loved ones! God has got Surprises in it for you. Welcome to another era of the baby boom!! !